If you’ve been diagnosed with bruxism, your dentist has probably recommended that you use a custom dental guard, which is also called an occlusal splint. Dental guards are not cheap however, and purchasing one from your dentist may cost as much as $500. If the hefty price tag nearly gave you a heart attack, don’t worry, ordering online can reduce this cost to nearly a fifth. Depending on how severe your bruxism is and your specific mouthguard needs, there are numerous mouth guard options online. 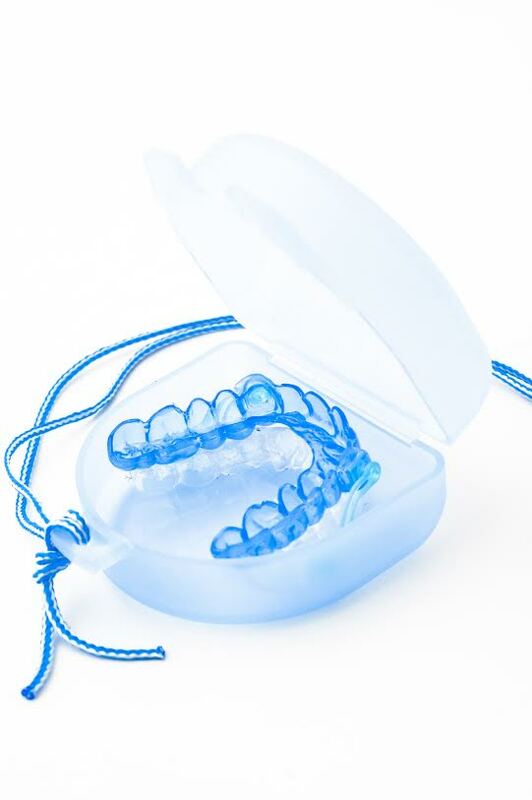 When you choose a night mouth guard online, it will cost between $100-200 and last from 6 months to 5 years. Keep these things in mind when you choose a night mouth guard. Your night guard is your best protection against bruxism, a condition in which you grind or clench your teeth. During the night it sits between the surfaces of your teeth and prevents the constant grinding and clenching from doing any significant damage to your teeth. To that effect, it is wise for you to perform proper night guard care. The better you take care of your night guard, the better it will take care of you. 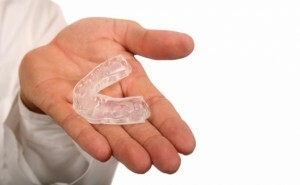 Mouth guards can help protect you from grinding and clenching your teeth. If you have a teeth grinding problem, your night guard is your best friend. With the help of this nifty little device, you can help alleviate headaches and keep your teeth healthy. Your night guard sees daily use and works in dirty conditions for long hours. As such, it is important for the health of both you and your night guard, to take good care of it. The cleaner you keep your night guard, the more likely it is to last a long time and provide the protection you need from your detrimental nightly habits. When you get your custom dental night guard, it comes with a protective case. The first step in night guard maintenance is to use it. Whenever your night guard is not in your mouth it should be in its case. This ensures that if you knock it off of the counter or drop it, your night guard won’t be so susceptible to damage. Night guards should be stored in cool dry places. The bathroom often seems like the most logical choice for storage, but when you shower, the room becomes excessively warm and moist. A better alternative is to keep it on or in your nightstand. There are many ways you can go about cleaning your night guard. Because it spends hours in your mouth, your night guards can develop bacterial growth and strange smells. Each morning when you remove it, practice simple maintenance by rinsing it with cool water or mouth wash before storing it for the day. Another option is to brush it with a toothbrush and toothpaste like you would your teeth. Though your daily cleanings will ensure that your night guard doesn’t get too gross, a weekly deep cleaning is still a good idea. This can be done with a bit of mild soap and cool water or store bought mouth guard cleaning tablets. It’s also important to give your night guard container a good cleaning every so often. Remember to do this by making it a part of your weekly night guard cleaning. While performing your weekly cleaning make sure to give your night guard a good examination. Look for cracks, worn down areas, and other damage. Bring your night guard with you when you go to the dentist so that a professional can give it an even more thorough check up. Why Would My Catonsville Dentist Recommend a Mouth Guard? Caring for your teeth sometimes requires more than just brushing and flossing on a daily basis, though that’s certainly a good place to start. Certain appliances are useful for keeping your teeth healthy and even relieving pain. 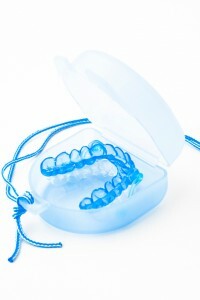 Mouth guards are one of the most commonly used appliances among adults as well as children and teens. They’re used for a number of reasons, and if your Catonsville dentist recommends a mouth guard, you should make sure that you’re using it when and how your dentist tells you to use it. Wondering why your dentist might recommend a mouth guard? We’ve got some answers for you! Treating TMJ (tempormandibular joint disorder) – TMJ is just a fancy way of saying “a jaw problem that causes pain.” TMJ can happen for a variety of different reasons, including injury, arthritis, or a tendency towards grinding your teeth. Either way, TMJ can be a painful condition for your jaw muscles. A mouth guard (usually worn at night for TMJ) will help you reduce the tension and strain in your mouth, helping to relieve headaches and jaw pain caused by TMJ. Sports – Certain sports are more dangerous for your teeth than others. Sports that require a lot of contact or balls are especially dangerous. Without a mouth guard, you run the risk of losing your teeth if the sport gets too rough. It’s important to wear your mouth guard from the time you step on to the field or court until you come off of it. You’ll want to avoid damaging or losing an adult tooth at all costs. Avoid wearing – Grinding your teeth is not only bad for your jaw, but it’s also bad for your teeth themselves. If you grind your teeth too much, you’re going to wear down the enamel. Your teeth become much more susceptible to bacteria and decay when your teeth don’t have enough enamel on them. Wearing a night guard will help you to avoid grinding and clenching your teeth in your sleep, when you have less control over it. 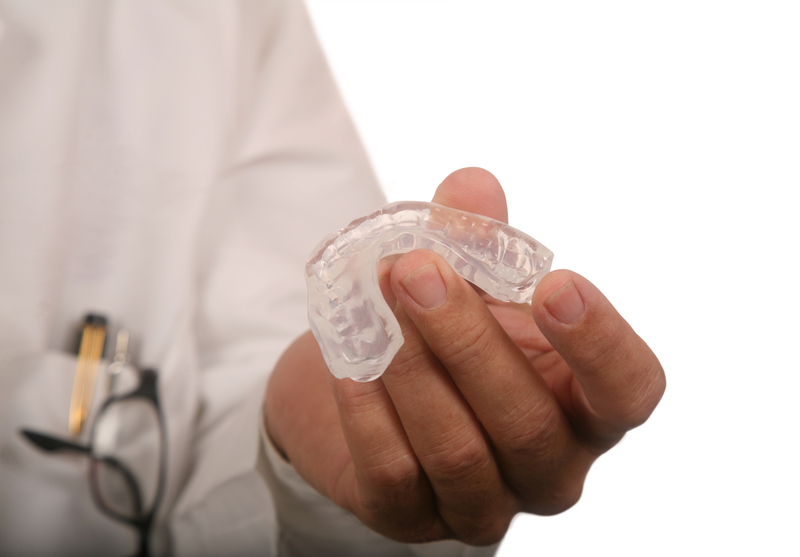 If you have clenching or grinding problems, it’s time to make an appointment for a custom mouth guard. You can contact Leikin & Baylin Dental Care of Catonsville, Maryland by calling 410-747-1115 or visiting CatonsvilleDentalCare.com. Do you wake up in the morning with a headache or a sore jaw? You may have a condition known as “bruxism,” which is the grinding or clenching of teeth during sleep. And because you are asleep when you may be completely unaware you have this condition. 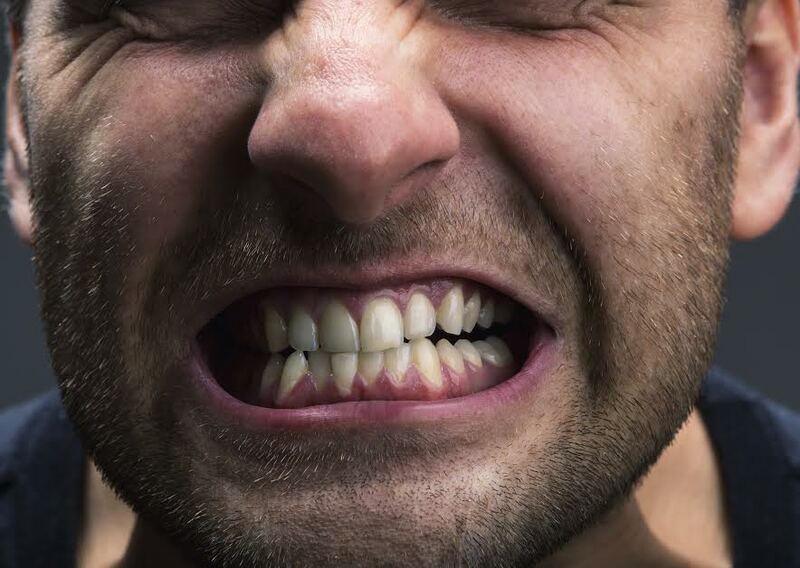 Besides causing pain, bruxism can eventually damage dental restorations, tooth enamel, and temporomandibular joints – the joints on each side of the mouth that connect the lower jaw to the skull. Bruxism can also loosen teeth, cause the cracking and fracturing of teeth, and make the tooth extremely sensitive to changes in temperature or pressure. One of the most popular treatments for bruxism is the use of a custom-made night guard. This device slips over the teeth, preventing contact with the opposing teeth. This relieves the pressures of grinding and clenching. Leikin & Baylin Dental Care of Catonsville offers custom-fitted night guards, mouth guards and tension-headache relieving appliances. If you have any questions about Custom Night Guards or wish to schedule an appointment, please contact Leikin & Baylin Dental Care of Catonsville, Maryland by calling 410-747-1115 or visit CatonsvilleDentalCare.com. What is Bruxism? Tooth Grinding of Course! If you are like most people, you probably have no idea what Bruxism is, right? Well, what about tooth grinding? Now that sounds familiar. Well, guess what? Bruxism is tooth grinding! And it affects 30 million to 40 million children and adults throughout the United States. Your husband, wife, roommate, or parents may hear a grinding sound at night. That could be you grinding your teeth. Do you suffer from dull morning headaches? Another symptom! Maybe you notice that your jaw muscles feel tight and painful after you wake up. That could be from grinding your teeth. What about long-lasting pain in your face? Yup! Another symptom. Your dentist may notice damaged or broken teeth and dental fillings. Of course, this is only if you visit your dentist regularly. Hint, hint! If you notice any of the above symptoms, schedule an appointment with your dentist as soon as possible. He or she will try to get to the root of the issue. They will examine your teeth and gums and ask you about your dental health, any increases in stress, and any medicines you may be taking. All could be possible triggers for bruxism. A more detailed exam may follow if your dentist suspects that your bruxism is related to dental problems. If your bruxism is stress-related, professional counseling may help. Or you could try stress relieving exercises and techniques. If your bruxism is the side effect of medicine, your doctor may switch your prescription. If your bruxism is the result of a dental issue, your dentist will correct tooth alignment. If you have any questions about bruxism, or wish to schedule an appointment, please contact Leikin & Baylin Dental Care of Catonsville, Maryland by calling 410-747-1115 or visit CatonsvilleDentalCare.com.